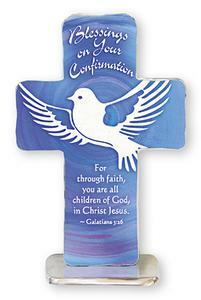 CATHOLIC GIFT SHOP LTD - Beautiful Confirmation Art Metal Standing Cross. Beautiful Confirmation Art Metal Standing Cross. Hand painted metal art infused with the artist's design, each cross is indivually hand polished.